The womb is the safest environment on earth. The fetus is warm, safe and well-fed during pregnancy, but according to a new clinical study, the womb of an obese woman is not as healthy as that of a woman of normal weight. According to the study, the area of the placenta that delivers nutrition to the fetus is smaller in obese women, thus the fetus receives less nutrition while the placenta holds on to the fat that should be delivered to the fetus. The effect of obesity on placental and fetal health is not changed if the pregnant woman decided to adopt a healthy, nutrition eating plan during pregnancy. The body is already programmed to act a certain way due to increase triglyceride and leptin levels. Changing diet after pregnancy does not have a significant impact on how the body reacts to food and that includes food processed by the placenta. 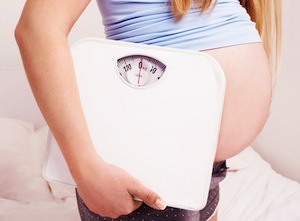 Obese women in the study gained less weight than their normal weight counterparts, which is suggested by obstetricians, but that did not impact the health or nutrition transport area of the placenta. When infants were born to obese women in the study they were about 17-percent lighter than expected weight. The reduced weight in combination with reduced nutritional support could cause long-term effects on health. Researchers are hoping to use this information to find biomarkers. The biomarkers could be used to test infants for possible lack of nutrition in womb and treat the infants soon after birth. Yuan-Xiang Pan, a professor at the University of Illinois, suggests the only way to protect the fetus is to lose weight and adopt a healthy eating plan before becoming pregnant. Reducing body weight by 10-percent has been shown to reduce blood pressure and risk of obesity-related disease, but just 10-percent may not be enough for obese women who want to start a family. Source: University of Illinois. Yuan-Xiang Pan. 15 April, 2012.